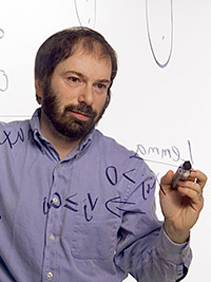 David Shmoys’ research focuses on the design and analysis of efficient algorithms for discrete optimization problems, and in particular, on approximation algorithms for NP-hard and other computationally intractable problems. His group has also been involved in the practical application of these techniques in settings ranging from genomics to medical aircraft scheduling to the long-term planning for the preservation of the red-cockaded woodpecker. His recent book, The Design of Approximation Algorithms, co-authored with David Williamson, was awarded the 2013 Lanchester Prize by INFORMS. Shmoys obtained his Ph.D. from the University of California at Berkeley.